"Temporary textile identification system "
Colour-coded tags are a simple way to avoid sorting errors. Items such as shirts can be placed on movable transporters or numbered rail clips right off the folder or finishing unit, reducing labour and boosting productivity. Labels print clearly, adhere firmly, peel off easily and can be adjusted automatically to match the number of characters. The Thermo-Seal® tag has positive lot control to prevent costly, time-consuming mix-ups and lost garments. Between four to twelve large, clearly printed numerals and letters can be set in seconds for any code. The Y-300 makes the registration of items easier and faster with barcode printing. It can be connected by a serial interface to a host computer so that the machine acts as a printer. The Y-300 offers barcode printing to make the registration of items easier and faster. If you have laundry software that is adapted to the use of barcodes you can have the maximum benefit of this machine. The Y-300 can be connected by a serial interface to a host computer so that the machine will act as a printer. 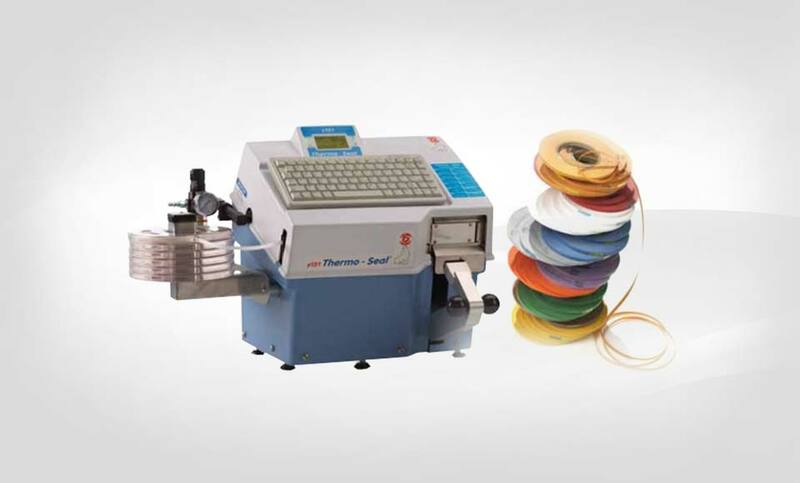 The tape is specifically made for Thermo-Seal® temporary marking machines and allows you to combine the color code with your printed code. It adheres firmly to cottons, polyester/cotton blends, loose weave polyester and wools and is available in eleven solid colors: orange, yellow, red, gray, lavender, white, green, pink, blue, gold and tan. This tape is specifically made for the Y-300. It is available in eleven solid colours: orange, yellow, red, grey, lavender, white, green, pink, blue, gold and tan and adheres to cottons, poly/cotton blends, loose weave polyester and wools. Please note that Barcodes need contrast and only work on lighter colours.